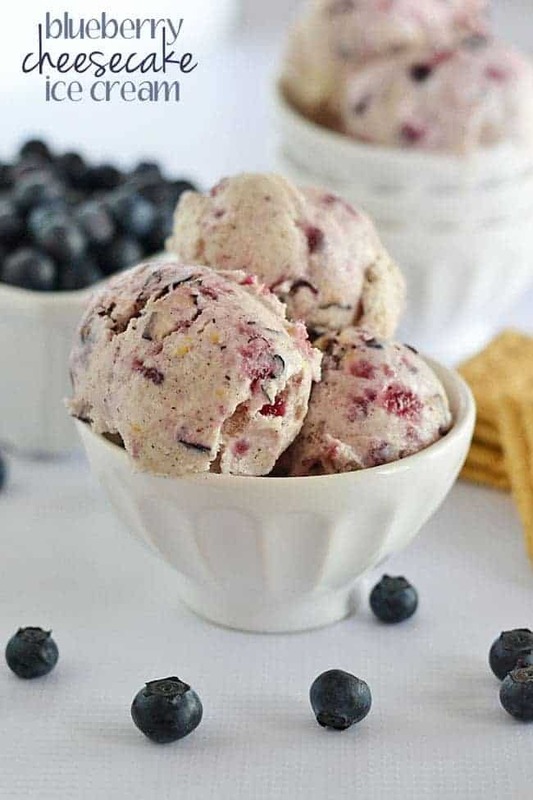 Filled to the brim with loads of berries, cream cheese, and buttermilk, this blueberry cheesecake ice cream will be tops on your summer recipe list this year! If there’s one love that I’m glad I passed to Doodle, it’s my love of ice cream. Also, a fascination with blogging, apparently. He’s been asking for weeks to start his own blog, and he finally got started over the weekend. I have to say, it made for some pretty proud mama moments when I saw him “staging” food and using my photo boards to take pictures. For a six-year old, I think he’s doing a pretty darn good job. You can check his blog out here, at Kitchen Meets Boy. 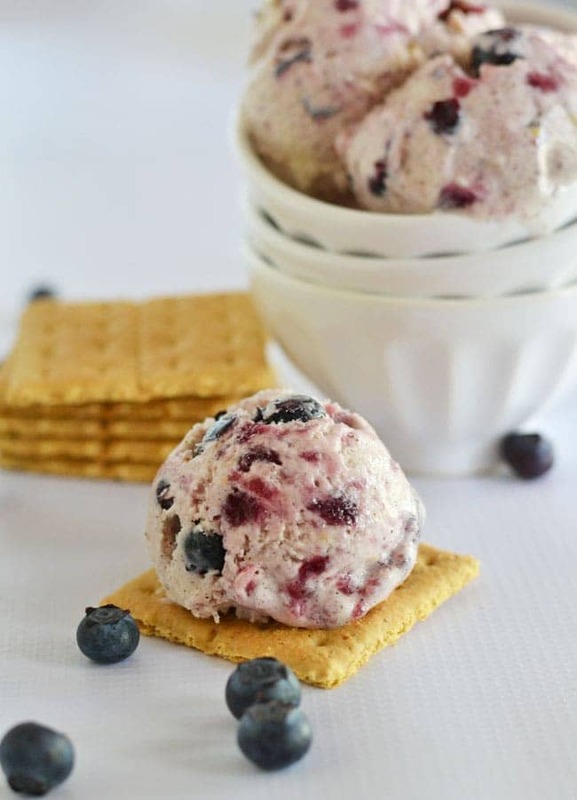 You should also check out this blueberry cheesecake ice cream. Not gonna lie: it’s one of my favorite ice creams, maybe ever. My birthday was over the weekend, and I knew the sweet-treat I most wanted to celebrate with was a big bowl of homemade ice cream. This recipe did not disappoint! 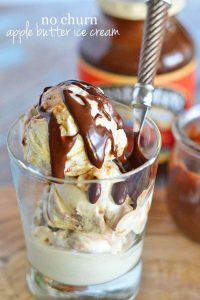 The base for this ice cream takes only a few minutes to mix up (no eggs, so there’s no cooking involved, just some chilling time). During the last few minutes of churning, you’ll dollop in a quick blueberry mixture…and then you’ll stand next to the machine drooling. I considered adding some graham crackers into the mixture as well, but in the end, I decided to just sandwich the cream in between some graham cracker sheets. Do you have an ice cream maker? What’s your favorite kind of ice cream? I’ll eat any kind you stick in front of me! Process the first 7 ingredients (through the salt) in a blender until smooth. Cover and chill for at least 2 hours. Pour mixture into the container of an electric ice cream maker and process according to the manufacturer's instructions. Mine usually churns about 25 minutes. While the ice cream is churning, place the blueberries, preserves, and lemon zest in a small bowl and mash slightly. Add the blueberry mixture during the last 5 minutes of churning. 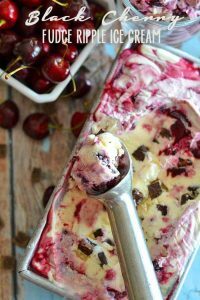 Place churned ice cream into a freezer-safe, lidded container, and freeze for an hour prior to serving. I love our Cuisinart ice cream maker. I am going to try this with cherries. I think you were right about the grahamn cracker, i think they would get soggy. Maybe as a topping??? One of our favorite recipes for coffee toffee is from Ben & Jerry’s recipe book. All the recipes are no cook. Coffee ice cream with heath bar pieces. Sometimes we put small choc chips in, that’s hubby’s favorite. I like doing the coffee so it’s just a tad on the strong/ bitter side. We also make frozen coffee drinks in the ice cream maker. We like to mix orange juice and pineapple juice and churn it into slush. It makes a nice thirst quencher for hot days. Alcohol can be added at the end to any slush drink if that’s what you like. Now, I am going to think about ice cream the rest of the night. Question: one of my favorite flavors of frozen yoghurt is cake flavored, how do they make it taste like white cake with frosting??? It contains no pieces of cake, just cake flavored. I sampled your ice cream last night and it was terrific. Really creamy and full of complementing flavors. First, happy birthday! Going to make this tonight with strawberries, thanks for another great recipe! 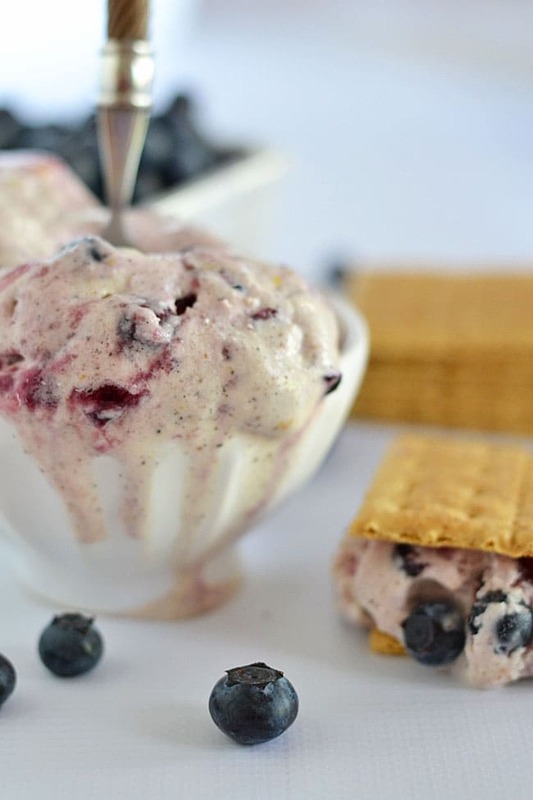 Blueberries and Cheesecake make an incredible combo for Ice Cream. YUM! Oh boy! This ice cream looks absolutely amazing! The perfect way to use fresh blueberries. I bet it was eaten in a flash! Happy birthday to you, happy birthday to you, happy birthday to Ashley, happy birthday to you! Trust me you would much rather I write it than sing it! Also, I am OBSESSED with this ice cream! 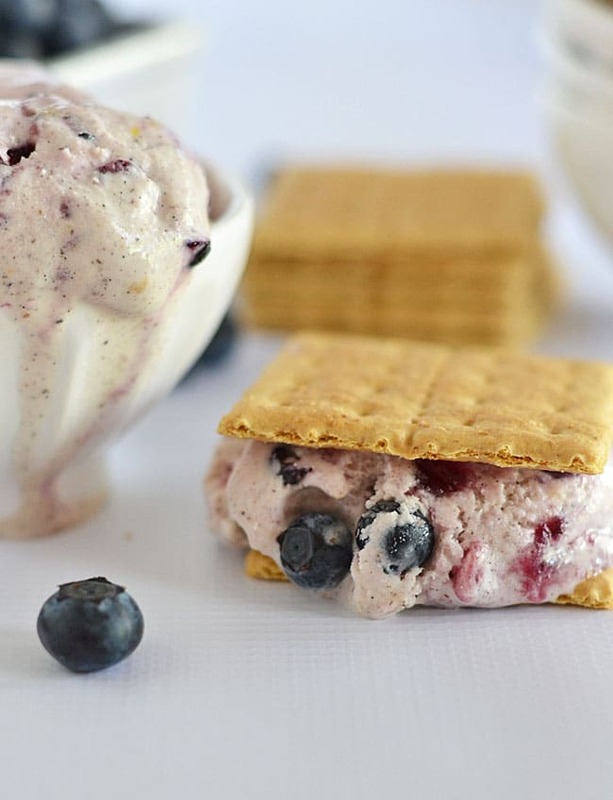 I have the best blueberry pie ice cream last summer and I have been dying to recreate it since. I think I have to make this one first! hi,what is half and half please? Half and half is a dairy product consisting of equal parts light cream and milk. Hope that helps! This looks SO amazing! Pinning!! Experience the fact and amount of true relationship with these gold Companionship Quotes. friendship forces you to believe more fondly concerning your buddies. I’ve been rather obsessed with fab frozen treats recently, and yours caught my eye! Such beautiful photos, my dear! Pinned this lish-looking recipe, and can’t wait to try it!